The Borkum West II wind farm will consist of 80 Areva MultiBrid M5000 wind turbines. Image courtesy of AREVA Wind. The wind turbines are supported by tripod foundations which are connected to a foundation structure installed underwater at depths of around 30m. Image courtesy of AREVA Wind. The turbines are assembled on land and carried to the site by cargo barges. Image courtesy of AREVA Wind. The final assembly of the first 40 units under phase 1 was completed in June 2014. Image courtesy of AREVA Wind / Jan Oelker. The wind farm will generate 1,200GWh annually and is expected to displace about 7mt of carbon dioxide emissions annually. Image courtesy of AREVA Wind / Jan Oelker. The second phase is expected to be commissioned in 2015. Image courtesy of AREVA Wind / Jan Oelker. 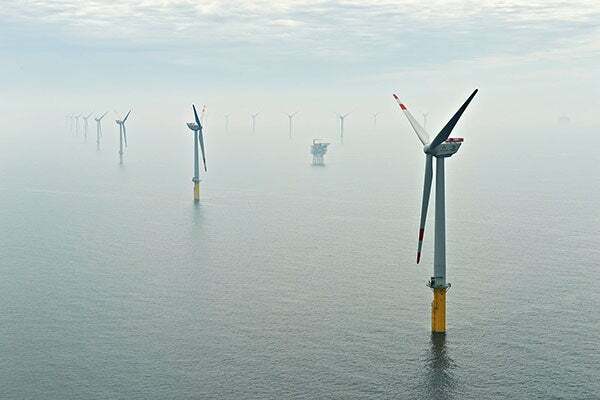 The 400MW Borkum West II wind farm is being built 45km offshore the Borkum island in the North Sea. Spread over 56km2, it is the first fully large-scale municipal offshore project in Europe. German utility company Trianel Windkraftwerk Borkum is carrying out the project at a cost of €1.6bn. The venture is expected to generate 1,200GWh annually to power nearly 250,000 households. The wind farm was approved by the Federal Maritime and Hydrographic Agency in June 2008. It will include 80 wind turbines with an individual capacity of 5MW, being installed in two phases of 40 turbines each. Construction of the first phase began in September 2011 and the final assembly of the first 40 units was completed in June 2014. The first turbine was installed in July 2013. The second phase is expected to be completed in 2015. The project is expected to cut 7t of carbon dioxide emissions annually and help the diversification of energy supply. A group of 11 banks is providing a loan of €550.5m for the project. The banks include UniCredit Bank, Dexia, Crédit Local, KFW IPEX-Bank, Coöperatieve Centrale Raiffeisen-Boerenleenbank, NRW.Bank, ASN Bank, Deutsche Bank, Helaba, NIBC Bank and SEB. In December 2009 the project received €40m in funding from the EU under the European Energy Programme for Economic Recovery (EEPR). The wind farm will consist of 80 turbines, each of which can rotate at speeds of 25m/sec. The turbines can also operate during heavy storms. A 400MW normally unmanned offshore substation will serve the wind farm. The substation will have traditional jacket and topsides facilities. "The venture is expected to generate 1,200GWh annually to power nearly 250,000 households." The wind turbines are held by tripod jackets connected to a foundation structure, installed under water at depths of around 30m. The turbines are connected to the tripods through steel piles with a diameter of 2.5m. All on-site works are being carried out using construction ships. The wind turbines are being assembled at Eemshaven near Borkum and carried to the site by cargo barges. Installation is carried out using cranes. Electricity generated by the wind farm will be transmitted onshore to the island of Norderney by a 65km direct-current submarine cable. From the island, the electricity will be fed into Germany’s high voltage network. SGS was awarded a contract to provide certification services for the project in May 2008. Project certification provided by SGS helped in obtaining the necessary approvals for the project. SGS will also provide supervision services during the construction. "The project is expected to cut 7t of carbon dioxide emissions annually and help the diversification of energy supply." In November 2009, Noble Denton and Germanischer Lloyd were awarded a contract to provide technical support and project management services for the wind farm. A joint venture between Nordsee Nassbagger und Tiefbau and GeoSea won a €70m contract in August 2010 for prepiling and installation of turbines in the first phase. Areva was awarded a €400m contract in December 2010 for supplying 40 wind turbines for the project. The company supplied its MultiBrid M5000 offshore turbines under the contract, which also includes option for an additional 40 turbines. Scope of work for Areva includes commissioning, testing and maintenance of the turbines. In February 2011, Alstom Grid won a contract to construct the topsides and substructure of the offshore substation. Alstom Grid was earlier awarded a contract to supply electrical system for the substation. Alstom subcontracted part of the work to WeserWind. Norddeutsche Seekabelwerke was awarded a €22m contract in February 2011 to install the submarine cables for the first phase of the project. The company will use its NOSTAG 10 ship to install the cables. SgurrEnergy, a multi-disciplinary engineering consultancy, was contracted in June 2011 to provide lender’s technical advice support that includes construction monitoring services for the project.